Knowing how to maintain your ideal home humidity is important for both your health and your living space. Too much humidity in your house can result in mold, wood rot and aggravated allergy and asthma symptoms. Dehumidifiers combat these problems by controlling house humidity, but older models consume significant amounts of energy and are susceptible to leaks and mold accumulation. 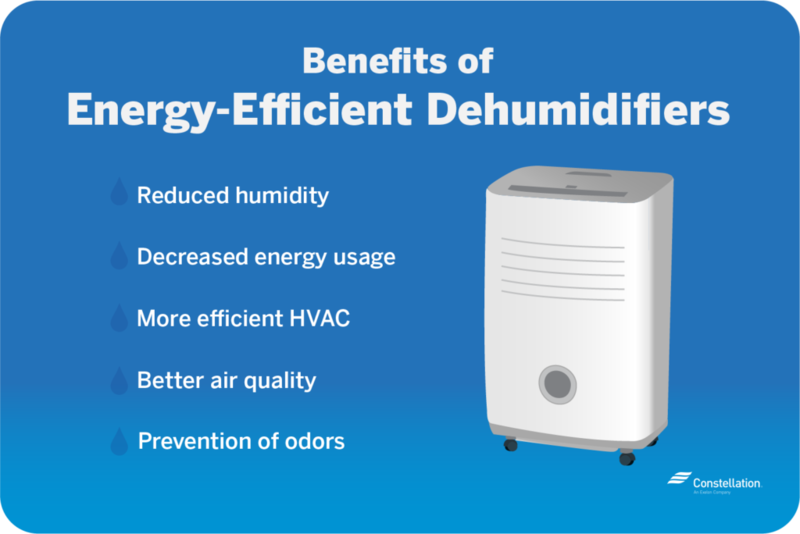 Professionals can examine homes with high humidity and excess dampness to identify potential problems, and the benefits of energy-efficient dehumidifiers can help you maintain your home’s humidity levels without inflating your energy bill. Pro Tip: If you’re looking for an energy-efficient dehumidifier, why not check out Constellation’s shop page for the best energy-efficient models available? What is the ideal home humidity? 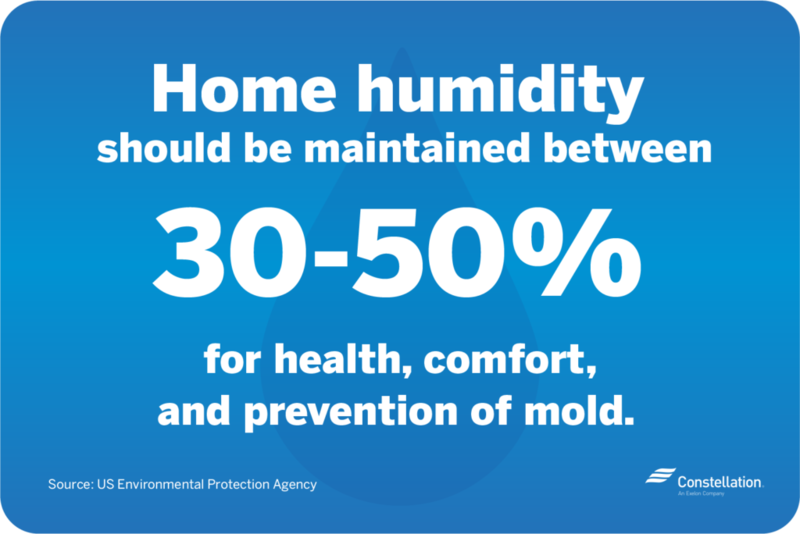 According to the US Environmental Protection Agency, ideal home humidity should be kept between 30 and 50 percent for health, comfort and the prevention of mold and bacterial growth. This level of humidity should be maintained during the summer and winter, with or without the use of an air conditioner. In cold climates, keeping house humidity at 30 percent helps prevent condensation on windows. Relative humidity, or RH, describes the amount of water vapor in the air in comparison to the maximum amount of water vapor the air can hold. RH changes with temperature, and anything higher than 50 percent RH encourages bacterial and mold growth. A dehumidifier with a built-in humidistat allows you to set the relative humidity for a room. Must or mildew odors. A strong smell of must or mildew may indicate high humidity and the possible presence of wood rot or mold. Wall and window condensation. Moisture condensing on walls or windows, especially in winter, may suggest too much humidity in the house. Water stains on walls or ceilings. While water stains may indicate attic or plumbing leaks, they can also be a sign of excess humidity. Increases in allergy and asthma symptoms. Dust mites and mold—two common allergens—thrive in high humidity, and people with asthma often find breathing more difficult in humid environments. Mold spots. High humidity encourages the development of dark mold spots on walls and ceilings, especially in bathrooms or other rooms where water is often used. Reduced humidity. This is, of course, the primary goal. A dehumidifier draws moisture out of the air for a more comfortable home environment. Decreased energy usage. Energy-efficient dehumidifiers save enough energy annually to power an ENERGY STAR®️–certified refrigerator for four months. A more efficient HVAC. Your HVAC system must work harder to cool moisture-laden air, while damp dust in the system’s ducts also increases workload. Dehumidifiers allow your air-conditioning and heating system to operate more effectively, reducing energy consumption. Better air quality. Ideal home humidity levels help to reduce airborne dust and mold particles, helping alleviate allergy and asthma symptoms. Prevention of odors. Dehumidifiers reduce unwanted smells by controlling dust, mold and mildew. Choosing the right dehumidifier for your home requires an understanding of the different types of dehumidifier, dehumidifier energy consumption, ENERGY STAR®️ certifications, dehumidifier sizing and house humidity level. When deciding on the best energy-efficient dehumidifier, you should pick a dehumidifier type based upon your home humidity levels, the location in your home, and the climate of where you live. There are several types of dehumidifiers to choose from. Compressor dehumidifiers work by passing warm, damp air over a refrigerated coil, causing condensation, which is then channeled into a tank for removal. The dry air is heated to room temperature and then released. Compressor dehumidifiers work best in warmer climates, as the condenser must be cooler than room temperature. They’re less suited to cold climates and can be bulky and noisy, so it’s important to consider their placement in your home. If you need to control basement humidity, a desiccant dehumidifier is a good choice. Desiccant dehumidifiers use a desiccant wheel to remove moisture, rather like the way silica gel keeps food items moisture-free. A built-in heater restores the wheel’s ability to absorb moisture. Though they are portable and more energy efficient than compression dehumidifiers, desiccant dehumidifiers are more expensive and are not as effective in warm climates. Thermoelectric dehumidifiers use a solid-state thermoelectric device to pump heat from one side of the dehumidifier condenser to another, cooling the opposite side. Air is drawn over the cold side, causing condensation, which is then stored in a removable tank. Thermoelectric dehumidifiers have few moving parts and maintain long life spans. Since thermoelectric dehumidifiers aren’t designed to remove as much moisture as compressors or desiccants, they’re best suited for small spaces such as closets and bathrooms. For this reason, a thermoelectric dehumidifier is probably not your best option for controlling basement humidity. To reap the benefits of using a dehumidifier, you’ll need to select the right model for your home. Dehumidifier features vary from model to model. While energy efficiency is important, homeowners should also look for features that allow you to control humidity levels and perform easy maintenance. Is the dehumidifier ENERGY STAR®️ certified? Dehumidifier energy consumption is an important consideration. When browsing be sure to check for the yellow EnergyGuide label, which will tell you if the product is ENERGY STAR®️ certified. Does the dehumidifier have a humidistat? Humidistats measure relative humidity and allow you to adjust the room’s humidity to fit your needs. Look for models with digital controls, which ensure ease of use when selecting your ideal home humidity. What are the water drainage features of the dehumidifier? Most dehumidifiers store condensed water in a tank or bucket for removal. Look for a model in which the tank can be easily removed or one that uses gravity or a pump to empty the tank into a drain through a connected hose. Can you check the air discharge location? How does the dehumidifier return dried air to the room? A model that releases air from the top of the unit can be placed directly against a wall, whereas others may require more space for air to circulate through the entire model. Does the model have a timer? A timer allows you to control when the dehumidifier turns on and off rather than manually turning it on or letting it run constantly, helping you save on dehumidifier energy consumption. Does the model restart automatically? 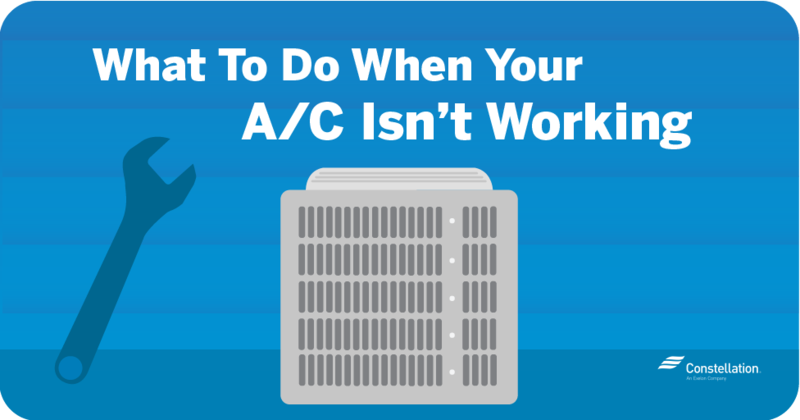 An autorestart option ensures the dehumidifier will turn back on again in the event of a power outage. Does the model have frost sensors? If the dehumidifier will be operating in a basement or a room subject to low temperatures, frost can build up on the condenser coils, limiting efficiency. A frost sensor directs the dehumidifier to shut off and defrost when this happens. Does the dehumidifier clean the air? Some dehumidifiers, like certain Frigidaire models, are built with antimicrobial filters that clean the air as they work. Add that to your list of benefits of using a dehumidifier! Are air filters easy to remove? Regular cleaning of dehumidifier air filters is essential for optimal operation. Check to see if the air filters are easy to remove, clean and replace. Can the dehumidifier link to a home hub? Some smart dehumidifiers can connect to your home automation technology so that you can manage their energy use from the comfort of your own smart device. 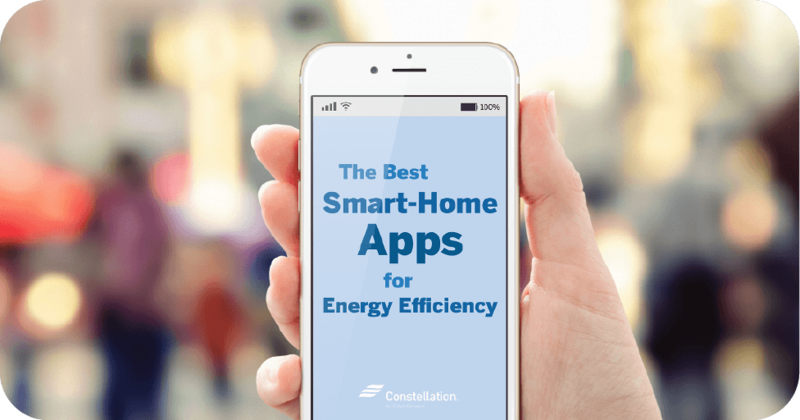 You can even look into adding it to your daily smart-assistant routine for more energy savings. Pro Tip: When looking at your dehumidifier, be sure to check the operating temperature range. Selecting a energy-efficient dehumidifier that fits the temperature range of the room you’re dehumidifying will ensure that your machine runs correctly and efficiently. 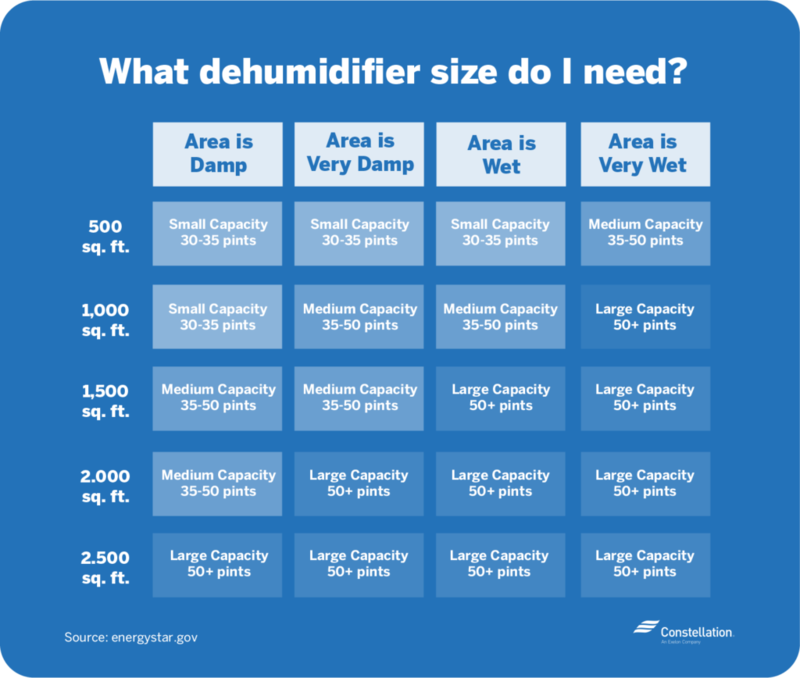 As most dehumidifiers store condensed water in a tank for removal, it’s important to determine the correct capacity for your needs. Too small, and you’ll be emptying the tank too often, while dehumidifiers that are too large for the space they occupy or too powerful for the relative humidity will consume more energy than you need to use. Tank capacity is measured in pints removed by the dehumidifier. Room size is calculated in square feet. The relative humidity of the room is also a factor when considering dehumidifier sizing, and it affects the amount of moisture the unit needs to remove from the air to attain the ideal humidity for your home. Large-capacity dehumidifiers can remove more than 50 pints of water a day. While rooms of up to 1,500 square feet are well suited to a large-capacity dehumidifier, room size is only one factor. Any space with excessively high humidity can benefit from large models, although they’re most often used for basements, garages and large rooms. Check out the Frigidaire 70 Pint Dehumidifier in the Constellation store. Medium-capacity dehumidifiers can remove about 50 pints of moisture a day. They are most often used for wet bathrooms as well as large bedrooms and living rooms. Check out the Frigidaire 50 Pint Dehumidifier in the Constellation store. Small-capacity dehumidifiers can remove between 30 and 35 pints a day and are best used in small spaces such as single rooms, closets and crawl spaces. Check out the Frigidaire 30 Pint Dehumidifier in the Constellation store. Whole-house-capacity dehumidifiers are just that—they can control humidity throughout the entire home. The cost of such units is high, however, and in most cases, they aren’t essential. Stand-alone dehumidifiers are sufficient to meet most residential needs. Does dehumidifier size affect energy use? According to the University of Berkeley, dehumidifier size and capacity can affect energy use. Depending on the size and capacity of the dehumidifier, watts usage can range from 300W – 750W. Dehumidifier watts are important to know when calculating the energy factor of your machine. The energy factor of a dehumidifier is measured in liters of water removed per kilowatt-hour, and changes depending upon the capacity of the dehumidifier. In order to be approved by ENERGY STAR®️, energy-efficient dehumidifiers must have an energy factor of at least 2.00, or an energy factor greater than 2.80 for dehumidifiers that remove more than 75 pints of moisture a day. Pro Tip: If you don’t know the energy usage of your dehumidifier, watts can be measured by using devices like P3 Kill A Watt Edge. Simply plug your dehumidifier into the device, and it can calculate the energy consumption of your machine in active or standby mode! Close all doors and windows. Removing humidity from a room doesn’t work well if more moisture is pouring in at the same time. Keeping windows and doors closed helps your dehumidifier remove moisture. Learning how to seal a door helps keep the room closed, as does installing the most energy-efficient windows. Repair air leaks. Window air leaks can let moisture into the home, so windows should be sealed. When checking for air leaks, check to ensure your attic ventilation isn’t affecting your home’s temperature and humidity. Be smart about placement. Position your dehumidifier away from sources of dirt and dust that could clog the unit’s internal parts and reduce efficiency. Improve your home drainage. Water can enter the house through clogged gutters and overwatered garden beds that sit close to the foundation. Once inside, water evaporates and increases humidity. Learning how to maintain an energy-efficient garden can reduce such risks. Seal cracks and prevent water damage. Foundation cracks are a common cause of basement humidity. Fixing foundation damage will reduce the amount of moisture your dehumidifier needs to remove. Keep an eye on dryer ventilation. Incorrectly installed dryer vents can blow moist, warm air into the house. For more information about how your laundry can affect your energy use, check out our laundry energy-saving tips. Clean air ducts. High humidity can result in damp dust accumulating in your ductwork. Learn more about how to clean it out with our DIY duct-cleaning guide. 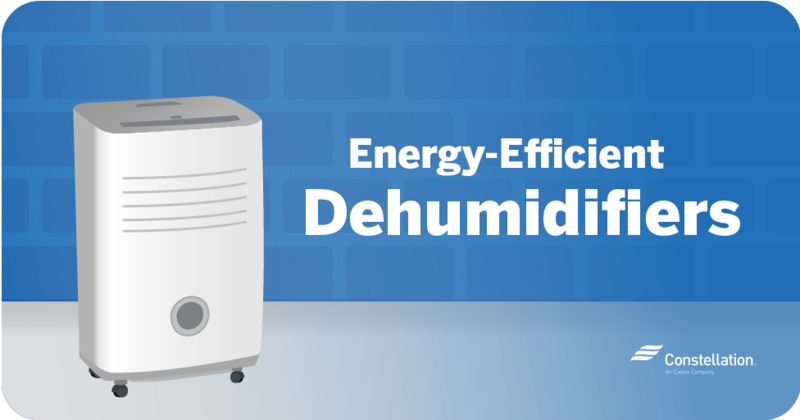 Energy-efficient dehumidifiers play an integral role in maintaining your ideal home humidity. From selecting the best dehumidifier sizing to the best energy-efficient features to look for, the proper dehumidifier improves your home’s air quality while preventing moisture damage to the building’s structures. With Constellation’s help, you can find the right dehumidifier for your needs, and you’ll have a healthier, more comfortable home. Can you recommend a Humidifier?? Our home is open airy and does not have a inside humidity problem, it is very dry in the winter when closed, We built with 6″ walls and upgraded thermol windows and doors. 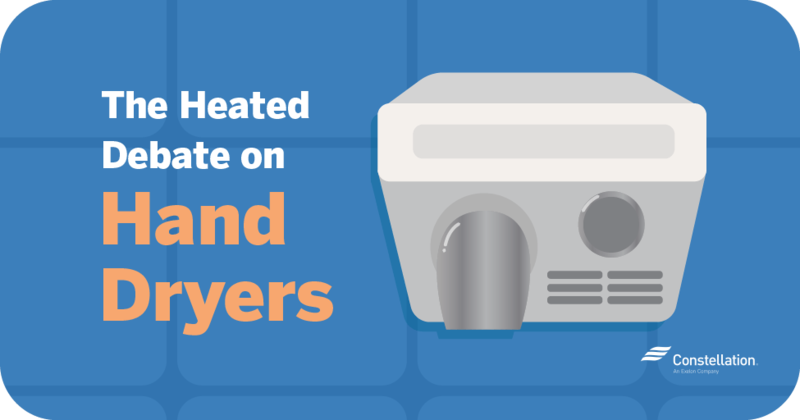 A furnace electric humidifier is very expensive to operate heating hot water in to the hot air system. Hi Richard, If you’re looking for the most energy-efficient humidifier, energystar.gov states that Ultrasonic humidifiers use the least amount of energy, compared to cool mist or warm mist humidifiers. These can be placed anywhere in the home. However, if you want a whole-house humidifier, fan-powered humidifiers use the least amount of energy, compared to steam and bypass.